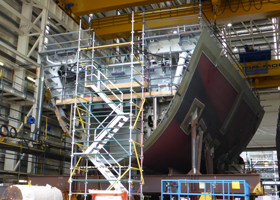 Ship building requires precision assembly in tough industrial environments, components used in shipbuilding and naval engineering must be verified against design specifications to ensure proper fit. The DMS is experienced in the manufacture of boats, ships and submarines using a variety of portable 3D measurement equipment including Laser Trackers, Total Stations, Photogrammetry & portable measuring arms. The DMS offers Measurement Services, SpatialAnalyzer Support and Equipment Rental Services to the Australian shipbuilding industry. In addition to supplying measurement services, the DMS also provides SpatialAnalyzer support and training to a majority of Australia’s naval ship yards including BAE Systems Australia, Australian Submarine Corporation and Air Warfare Destroyer (AWD) . The DMS also provides equipment rental to the Ship and Submarine industries including Laser Trackers and Total Stations. Visit our equipment rental page to find out more.